“Playing for England is incredible but when you lose that, you feel a bit empty,” Tom Westley says, sitting in an office in the pavilion at Chelmsford. Called up midway through the 2017 home summer for a Test debut against South Africa at The Oval, five games later the Essex batsman was out of the team and not in that winter’s Ashes squad. He hasn’t had a look in since. International sport can be a harsh business at times. Westley knows he didn’t score enough runs in those five games. A half-century on debut against the class of Morne Morkel, Vernon Philander and Kasigo Rabada in mightily tough conditions suggested big things ahead but his returns dwindled after. He averaged just 24 that summer and although there were mitigating circumstances – Sir Alastair Cook said it was the toughest home season for batting he had been through – Westley cannot escape the frustration of knowing he didn’t do himself justice. 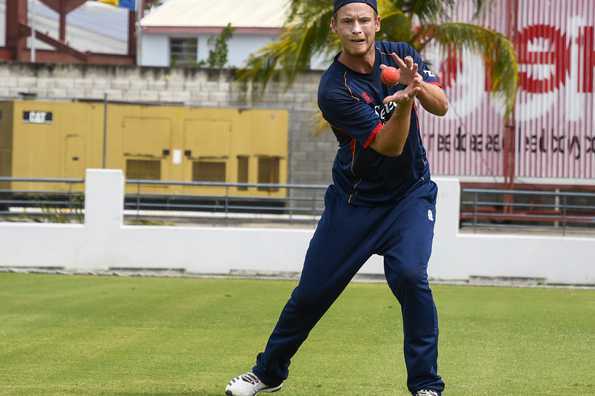 Otherwise, Westley describes his England experience as “incredible” and being a part of series victories over South Africa and then Windies are memories that he will cherish forever. Yet, he admits now that he was probably more affected by his dropping than he let on at the time. Missing out on an Ashes series, the pinnacle for any England player, was a crushing blow, particularly after being so close to achieving it. He began last season saying all the right things about being up for the challenge of getting his spot back by scoring runs for Essex but deep down, he felt different. Major surgery on a finger injury before the season didn’t help and nor did some technical changes he implemented. Runs were hard to come by. “When you strive to play for England from a young age as I did – that’s the reason I played the game – to have not gone on the Ashes tour, if I was being honest with myself I was probably a bit deflated. Westley didn’t score a Championship hundred until the second week of September against Notts, finally ending a poor run which cost him any chance of a quick England recall. He then followed it up in the final game of the season, making 134 in the victory against Champions Surrey at The Oval, a reminder that despite his initial struggles at Test level, he remains a classy operator. It was a season of two halves but at least he ended it reassured that he still had the game which got him noticed in the first place. Although he dodges the question neatly, it is fair to ask whether Westley was discarded by England too soon. Five Tests in a terribly difficult summer for batting is far less opportunity than has been afforded to others such as James Vince, Gary Ballance and Keaton Jennings, for instance. And with England’s top order still a bit of a shambles, a strong start to the season in red-ball cricket would surely put his name back in the frame. Rather like his own performances, Westley doesn’t think Essex did themselves justice last term. A third-placed finish in the Championship and reaching the quarter-finals of the 50-over competition – the less said about their T20 campaign the better – looks like a solid enough season but it is a mark of the club since their recent resurgence, including that famous Championship victory two years ago, that they were far from satisfied with that. “As a team, we didn’t perform to our potential,” Westley, the vice-captain, says. “The second half of the season, we played like Essex the previous year. Finishing third is not a bad effort but we finished disappointed given how well we could have done. Beating Surrey at the end, who were deservedly Champions, it’s given us a lot of optimism for this year. It wasn’t so long ago of course that Essex were treading the boards of mediocrity in the bottom division of the Championship. Those players who are now mainstays of the team were just making their way then, but it was a very different game-plan too, built around counter-attacking batting and medium pace bowling. The four-day pitches at Chelmsford were tough to navigate and Westley, alongside some others, struggled at times. “To come through that – I wouldn’t say unscathed because it’s dented a lot of our averages and career records – but it has made us better players,” Westley says. “It was just about getting through. A couple of players got released or it didn’t work out here but on better wickets, they might have thrived. While Westley will be relied upon for runs at number three this season, opener Nick Browne will look to press further his international claims after a number of consistent seasons while fast-bowlers Jamie Porter, an unused member of England’s squad last summer against India, and Sam Cook are highly thought of too. One of those previous England captains will be back in the ranks for the next three seasons. When Essex won the Championship in 2017, Cook played seven matches and averaged 66. Now retired from Test cricket, his full-time presence at the top of the order will be a huge bonus to Essex’s hopes of challenging in both four-day and 50-over cricket. Given the quality of overseas signings they have made too, including Australians Peter Siddle and Adam Zampa and Pakistani Mohammad Amir at various stages, Essex certainly have the raw materials to mount challenges in all three formats. Time this winter spent reflecting on how to improve their T20 cricket after a period of stagnation should prove dividends in the Blast and last season proved they are a match for anyone in 50-over and Championship cricket.